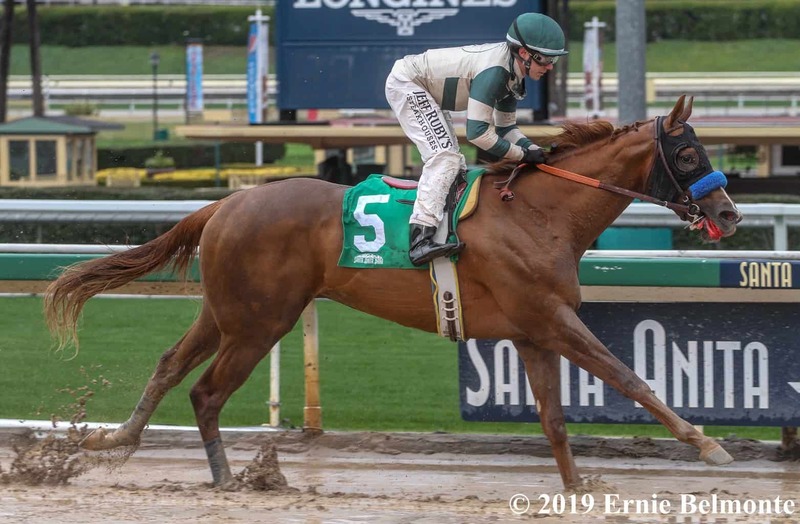 ARCADIA, CA – Michael Petersen’s Mucho Gusto was very much the best on Saturday, romping home like a true-blue mudder in the Grade 3, $150,000 Robert B. Lewis Stakes at Santa Anita Park. Breaking sharply from the outside post 5 under Joe Talamo as the 3/5 favorite, Mucho Gusto initially showed early speed before allowing Magnificent McCool to take command through opening fractions of :23.67, :46.55, and 1:10.51. Ranging up along the pacesetter’s outside in the far turn, Mucho Gusto took the lead with relative ease, then hit the top of the stretch ready to run home. The Bob Baffert trainee drew off impressively before crossing the finish line 4 3/4 lengths in front in a final time of 1:41.81 for the 1 1/16-mile event over the sloppy (sealed) main track. Gunmetal Gray put forth his customary grinding effort in the stretch, getting up for second over Easy Shot by a 1/2-length, while Magnificent McCool weakened in the stretch run to finish fourth. Tragedy struck shortly after the field hit the backstretch when Kid Cantina, racing just inside of Magnificent McCool, took a bad step and was pulled up before being vanned off. After careful evaluation, his connections made the decision to humanely euthanize him. Nolo Contesto was scratched. The Robert B. Lewis is part of the Road to the 2019 Kentucky Derby prep race season. Mucho Gusto earned 10 points for the win, with Gunmetal Gray receiving 4 for second, Easy Shot 2 for third, and Magnificent McCool 1 for fourth. Mucho Gusto’s win was his second in a stakes event following his Grade 3 Bob Hope Stakes triumph last summer and improved his overall record to 4-3-1-0. The 3-year-old son of Mucho Macho Man, who suffered his only defeat last out in the Grade 1 Los Alamitos Futurity Stakes, has now earned $234,000 after being purchased for $625,000 last May. Mucho Gusto returned $3.20 to win, $2.20 to place, and $2.10 to show. Gunmetal Gray brought back $2.40 to place and $2.10 to show, while Easy Shot paid $2.60 to show.